If i’m being honest the only reason I visited Restaurante Zé Carlos was because it’s just around the corner from the apartment I was staying in. It didn’t look particularly inviting from the outside and the menu looked fairly basic. Day 3 of the now customary ‘couvert’ was OK but definitely the weakest olives and bread we’d received so far on the trip. The olives didn’t seem as fresh or high quality and the bread was a little dry. It soon picked up with our starters though. 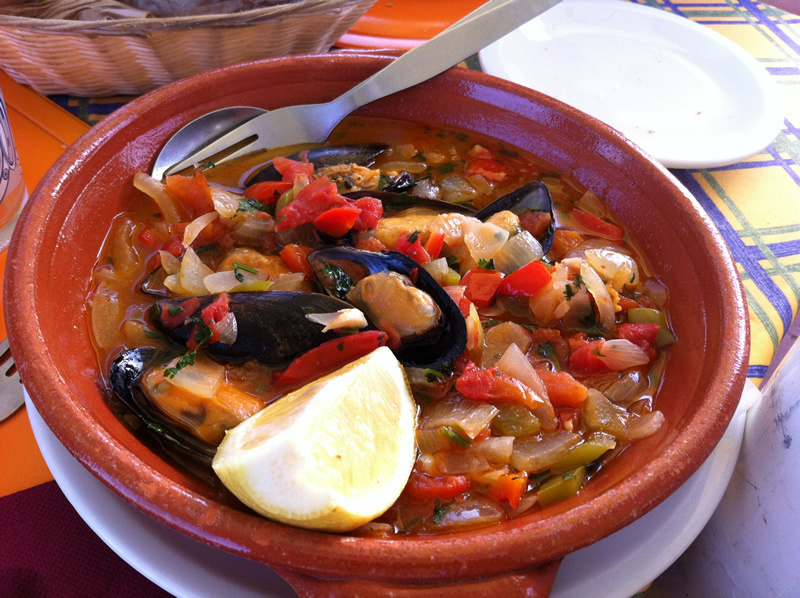 Mussels with the popular Algarve combination of tomatoes, peppers & onions. There weren’t very many mussels which was a shame but the few there were tasted great, fat, juicy, cooked to perfection and the vegetables were just delicious. 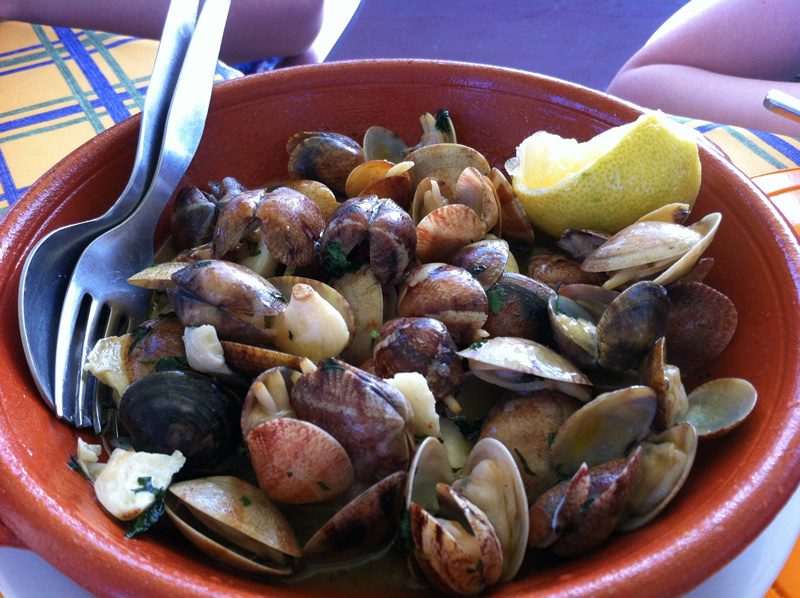 The second starter of clams was equally good and there was plenty of them. They were served in a simple broth of their own juices, lemon and plenty of garlic. 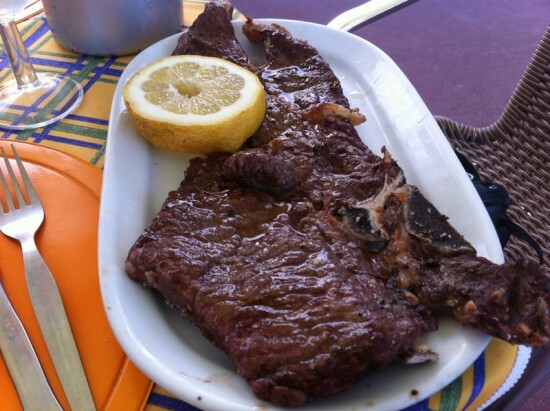 After eating a lot of seafood on the trip so far I fancied a good steak and that is exactly what I received. A huge t-bone perfectly cooked (exactly medium-rare as requested) and very highly seasoned, some people would probably think too much but I loved it. My partners ‘Brazilian’ steak was served with rice, black beans and pineapple which worked really well. The desserts were good as was the house wine (a recurring theme if you’ve read the other reviews from this trip). Service was fine, it was very quite when we arrived but very busy by the time we left yet we never had to wait long for anything. I’m glad that I decided to visit O Careca as I had a good evening and will try not to judge restaurants by their exterior from now on!